By now everyone should have checked their bees. The check should have been for a laying queens. This is for packages and overwintered colonies. The queen has to be laying for the hive to move forward. Don't assume the queen is good. Beekeepers who do this will find a hive so depleted of bees that it will not continue to function. Beekeepers need to look. To do a divide you need eight frames of brood and bees to do a divide. If you don't have this, you need to wait until you do. Some colonies coming out of winter with maybe four frames of bees right now, probably will never be able to split. Doing a split late say after the second week of June, is not advisable. The late splits will weaken the parent colony and it will not produce much honey. the split at that point will not produce any honey and will have to be fed most of its winter stores. Walk away splits should not be done this year in the month of May. The late spring and the delay of natural pollen will have many hives with low drone populations. Natural pollen started coming in a week ago for the first time. It is the inflow of natural pollen that spurs a colony to raise large drone populations. Even if the bees started raising drones in large numbers, say by today. It will be near the end of May before we get any emerging drones. Then it will take a while before they can fly and are sexually mature. This may put us into the first two weeks of June. Getting a queen properly mated will be difficult at best. Doing a walk away split or thinking that the bees will just make a queen, may prove to be a waste of good brood or the hive will get so depleted of bees that it may turn to laying workers or perish. We will be getting our first shipment of queens this week. 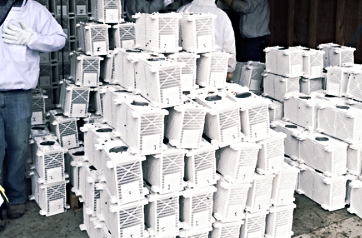 This first shipment will be not be a large number of queens, about 150 queens. They will go fast. Then for the next month we will be getting weekly shipments of queens. The queen shipments should arrive sometime on Wednesdays. With this cool spring, everything is behind. The dandelions should be blooming about right now for most if us. It may be we won't see dandelions in large numbers for 10 days yet. The fruit bloom that normally hits by mid May will probably show up in the later part of May. This all can change if we get warmer than average days. Splits that usually happen in early May will now be more likely after May 10th. All of the delays because of the weather should also affect the nectar flow. If we have normal temperature from now on, the nectar flow may not start until early July. This will give package bees, nucs and weak colonies time to develop. Swarm control will have to be in place for strong colonies. The delay in the nectar flow may put many strong colonies up into a tree. We are out of queens other than the few that I promised to beekeepers today. Our next shipment of queens will be on this coming Wednesday, May 2nd. I do have a few queens available for emergencies and for package bee purchasers who are having queen acceptance issues. The first shipment of queens will be starting next week. I will be getting weekly shipments of queens through the month of May. Overwintered colonies should be looked at now. Remove the winter cover and stow away until fall. The hive can be broke down to clean off the debris that is on the bottom board. This can be quite a bit, bring a box with you and put the debris in the box. Discard properly later. Give the hive a reversal as I described in a previous post. Check the egg laying pattern of the queen. Sometimes it is not uncommon to find that you are queenless and a new queen should be installed as soon as possible. 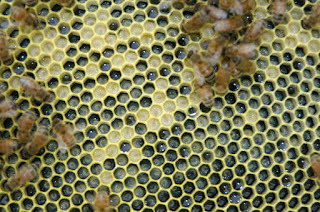 If the queen looks good make sure there is a pollen patty on the top bars of every box. This makes sure that pollen is available to the bees on any level of the hive. It does not have to be a full patty, a 1/3 to 1/2 patty works. Replace as needed. There is natural pollen just starting to come in right now. But the bees have more than likely ransacked their stored up pollen, so pollen patties should be in place for a few weeks. By now all the package beekeepers should have their bees outside. The bees should be flying today and possibly bringing in some new found pollen. All package beekeepers should be looking at their bees 7 to 10 days after hiving the bees and looking for eggs. 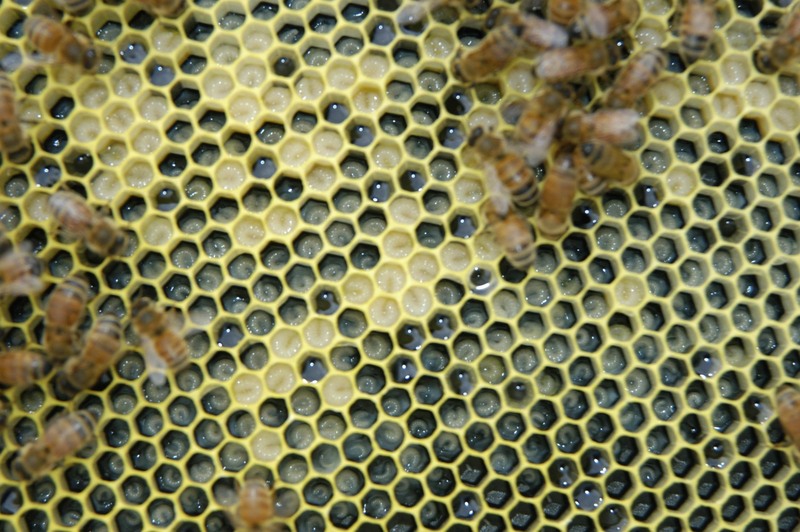 Seeing eggs in the hive is an indication that the queen has been accepted. 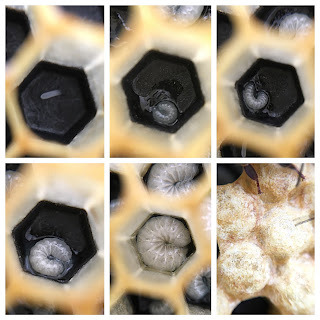 Not seeing eggs in the cells is an indication that the queen has not been accepted for some reason and a new queen should be installed into the hive. This pic shows all stages of egg, larvae and large larvae that is close to start capping. All the whitish liquid is royal jelly. I will be getting 300 - 3 lb packages. Any of my customers that lost their bees during this unprecedented cold weather will be given the opportunity to purchase first. I am sorry you lost your bees but this is farming. Any farmer can lose their crop due to frost, too much rain, too little rain, hail, locusts and mites. We all roll the dice when we do farming activities. You need to call or email me today if possible so I can have a number to reserve. If anyone is thinking about ordering, do not mail me an order form. I may be sold out of these by tomorrow and the mail won't be here until Tuesday. Call or email me. I will answer the phone the best I can. Leave a message if I don't pick up, say your phone number twice. If my voicemail box gets full, email me what you want. The weather is gorgeous. Put your bees out. Best to carry them to their spot. Set them down. Open them up about two hours later. The bees will be pouring out of the open entrance right away. Best to open them up in the afternoon when it is warmer and they can fly and return. When package bees come to me, there is always loose bees on the outside of many of the cages. We collect them when it is cool and put them in a nuc box. If it is warm out when the bees come, we cannot collect them because they fly away. I took one of the nuc boxes outside last night, because it needed a queen. I couldn't open it up in my garage as the bees would have poured out in the garage. When I opened them up outside, fifteen minutes later, the bees poured out of the nuc. They settled down a short time later and I put the queen in. It was cooler out last night and I know some of the bees did not return. So releasing them when it is in the upper 50's should be warm enough for them to return. Sorry my posting has been pretty lean during these two bee deliveries. The weather for bees has been terrible. The cold weather has made package bees installation more challenging. But, it looks like the weather is going the right direction and beekeepers that had to install their bees in warmer locations should be able to move them outside by Sunday. Long term weather outlook looks like no more deep freeze. Overwintered colonies are slowly moving forward. Strong colonies should be on schedule for a reversal, finally, this weekend. Weak colonies may not be able to reverse quite yet. To do a reversal on an overwintered colony, three deep hive. Bottom box to top and the top and middle box move straight down. On a two deep hive, self explanatory, switch the two boxes. We should see pollen coming into the hives this week. Pollen patties should still be in place on over wintered colonies. Pollen this time of year can be a little unreliable due to cool weather. Beekeepers that installed two pound packages will be able to check their hives this weekend for queen acceptance. The first check is for eggs. If you see eggs in a nice concentric pattern, with the queen hitting most of the open cells, then the queen should be good. Failure to do a check for queen acceptance can lead to problems. If the bees did not accept the queen, a new queen needs to be installed right away. Failure to put a queen in right away can lead to laying workers and possibly a failed hive. I am getting more 3 lb packages. Italian or Carniolan. You may not have a choice. It will be one or the other. Delivery date of May 7th. I start taking orders on Friday of this week. Many people have picked up their bees. There are about 250 people left to pick up. The bees need to be picked up tomorrow, Monday. The feeder cans are getting light so it is your responsibility to pick them up on Monday. I have a few exceptions that I am working with. The Monday pickup schedule has been modified to fit the whole alphabet. Please stick to the pick up schedule. We have to spread this out over the whole day to be able to help everyone in a speedy manor. We are all plowed out and ready for customers starting at 7:30 am to 7 pm. We will be here today, Sunday or tomorrow, Monday. There will be a crew lunch from 11:30 - 12:30. Please no customers then. If anyone wants to pick up bees today. Please call for an appointment. 651-439-8793. We will be scheduling appointments on the quarter hour slots. e.g. 9 am - 9:15 - 9:30 etc. I need appointments so I don't have 100 people here at once. We will schedule from 9 am to 2 pm. Then snow is supposed to pick up again. Plan your route with the existing road conditions to best meet your time. The delivery date has changed for the beekeepers who were on the Saturday schedule. Saturday pickup is now moved to Monday. Please stick to the delivery schedule. The bees will be arriving sometime on Friday. 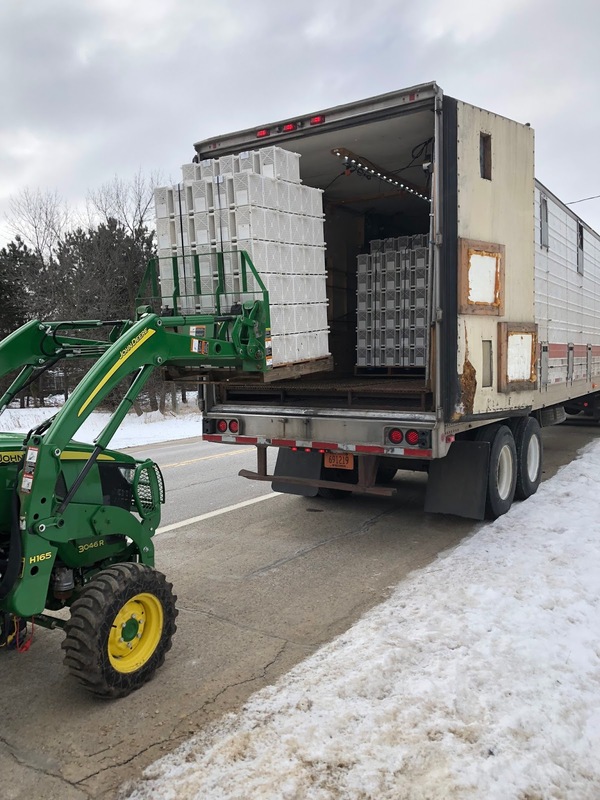 We will be open for the distribution of bees after the truck is unloaded. Saturday: Closed because of snow, No Handing Out Of Bees We will keep our eye on the forecast. Sometimes a spring winter storm can fizzle out, we will keep looking for changes in the storm. Sunday: We will update this post Sunday morning. The 3 lb delivery of bees are scheduled for this weekend. I do not have a pickup schedule yet. The weather for this coming weekend looks rainy, windy and cold. If it comes in a little cooler it could possibly be a snow event. The delivery truck should be leaving California on Wednesday. Not sure of weather impact on the delivery route yet. I am not sure how to approach the bee pickup yet. I want to wait a day to make a decision on the pickup schedule. Many factors not clear at the moment, please check this blog everyday for possible scheduling updates and possible delivery date changes. The 2 lb package bee pick up schedule is a couple posts down. Scroll down to see the bee delivery schedule. Please look at and follow the pick up schedule. We need to spread people throughout the day to be able to help everyone in a speedy fashion. To familiarize everyone what it looks like at our location these are two videos of what the road looks like one mile from Nature's Nectar LLC. Just pretend it is all white instead of green. I anchored the bottom board to the bottom deep box with a short 1 x 4, I put gorilla tape over the entrance reducer. Also I took 3 ft long 1 x 4 for carrying handles and screwed them to the side of the bottom brood box. This can be a good setup for garage installing. I removed the top box and feeder pail. Put the tele cover back on. Now I can carry this out of my garage and to my beeyard easier at a later date. The 2 lb package bee pick up day will be this Saturday. Scroll down this page for pick up schedule. Please follow the pickup schedule it is the best way to quickly pass out bees. If everyone came at the same time it would take several hours to help you. When the pickup schedule is followed, the wait time is usually five minutes. It will be cold when the bees come in. I don't like it either. They bees can ride in your backseat. Put down cardboard on the seat. The cages may be sticky. We do our best to brush the bees off the cages. If you are not going to put the bees in right away, put the bees on a large piece of cardboard in your basement. Your garage may bee too cold. 60 degrees is perfect. Feeding bees in the cage can be done by spraying the cage with sugar syrup and a spray bottle. Spray the cage where the bees are clustered, you can see them clustered in the cage. Get the cage wet, don't drown them, top of cage and sides and walk away. Come back after 1/2 hour and wet the cage again, wait 1/2 hour and do it again. If the bees are not going in the hive right away, feed them twice a day. Feed the bees like this about two hours before they are installed in the hive. This will help the bees produce heat if their gut is full of syrup. You can keep the bees like this for about three days. After that you will start seeing dead bees in the bottom of the cage. Installing bees in the garage. You can put your bees in a hive in your garage. Prep the hive by anchoring the bottom board to the deep box.This will make it easier to move later. Screw a 1 x 4 to the bottom board and the brood box. use about three screws in the bottom board and three screws in the brood box. Do both sides of the hive. Or, search my blog for moving hives and look at the picks on how I anchored the box and bottom board together. Have your entrance reducer in. Duct tape across the entrance, totally covering the entrance reducer. Do a Red Green tape job. You want to make sure the bees stay in the hive. Install the bees. No spray if it is cold in the garage. Move the bees outside in a few days when it warms up to the forties. Take the feeder pail off and remove the top box, put the cover back on, when moving the bees to their outside location. It is easier to move them in the one deep box. I screw 2 - 1 x 4's about 4 feet long to both sides of the deep box. This creates two lifting handles and two people can easily move the box together. First delivery is only 2lb packages. Keep checking this blog for updates as the date can still possibly change. PLEASE READ THIS ENTIRE POST IF YOU ORDERED BEES FOR THE FIRST DELIVERY. The second delivery is April 14th and is all 3 lb packages. The bees are scheduled to arrive sometime on April 6th. The arrival time is not known so please watch the blog for an announcement that we are ready to distribute packages. No bees will be distributed prior to announcement on blog. This pick up will be first come, first served. Do not come here before it is announced that the bees are ready to pickup. You will be asked to leave. You cannot park out on the road. Bee Day! Schedule is below. Saturday, April 7th will be the main pick up day and we will follow the schedule below. If everyone came at once there would be several hours wait to get your bees. With the schedule, everyone is spread out over the course of the day and wait times are very short. The store will be closed on Bee Day. Limited supplies will be available and are listed at the end of this email. Bees will also be available for pick up on Sunday, April 8th. Check the blog the morning of the 8th for any changes in the pickup schedule. Our bee supply store will be open on Monday April 9th. We will not take credit or debit cards on bee pick up days.